A wide-angle view of the star HD 106906 taken by the Hubble Space Telescope and a close-up view from the Gemini Planet Imager reveal a dynamically disturbed system of comets, suggesting a link between this and the unusually distant planet (upper right), 11 times the mass of Jupiter. Click image for hi-res versions & caption. Paul Kalas image, UC Berkeley. The planet may even have its own ring of debris that it dragged along with it. “The measurements we made on the planet suggest it may be dustier than comparison objects, and we are making follow-up observations to check if the planet is really encircled by a disk – an exciting possibility,” added Abhi Rajan, a graduate student at Arizona State University who analyzed the planet images. The disturbance could have been caused by a passing star that perturbed the inner planets, or a second massive planet in the system. The GPI team looked for another large planet closer to the star that may have interacted with the exoplanet, but found nothing outside of a Uranus-sized orbit. Kalas and Rajan will discuss the observations during a Google+ Hangout On Air at 7 a.m. Hawaii time (noon EST) on Dec. 1 during Extreme Solar Systems III, the third in a series of international meetings on exoplanets that this year takes place on the 20th anniversary of the discovery of the first exoplanet in 1995. Viewers without Google+ accounts may participate via YouTube. A paper about the results, with Kalas as lead author, was published in the The Astrophysical Journal on Nov. 20, 2015. The star, HD 106906, is located 300 light years away in the direction of the constellation Crux and is similar to the sun, but much younger: about 13 million years old, compared to our sun’s 4.5 billion years. Planets are thought to form early in a star’s history, however, and in 2014 a team led by Vanessa Bailey at the University of Arizona discovered a planet HD 106906 b around the star weighing a hefty 11 times Jupiter’s mass and located in the star’s distant suburbs, an astounding 650 AU from the star (one AU is the average distance between Earth and the sun, or 93 million miles). The GPI Exoplanet Survey, operated by a team of astronomers at UC Berkeley and 23 other institutions, is targeting 600 young stars, all less than approximately 100 million years old, to understand how planetary systems evolve over time and what planetary dynamics could shape the final arrangement of planets like we see in our solar system today. 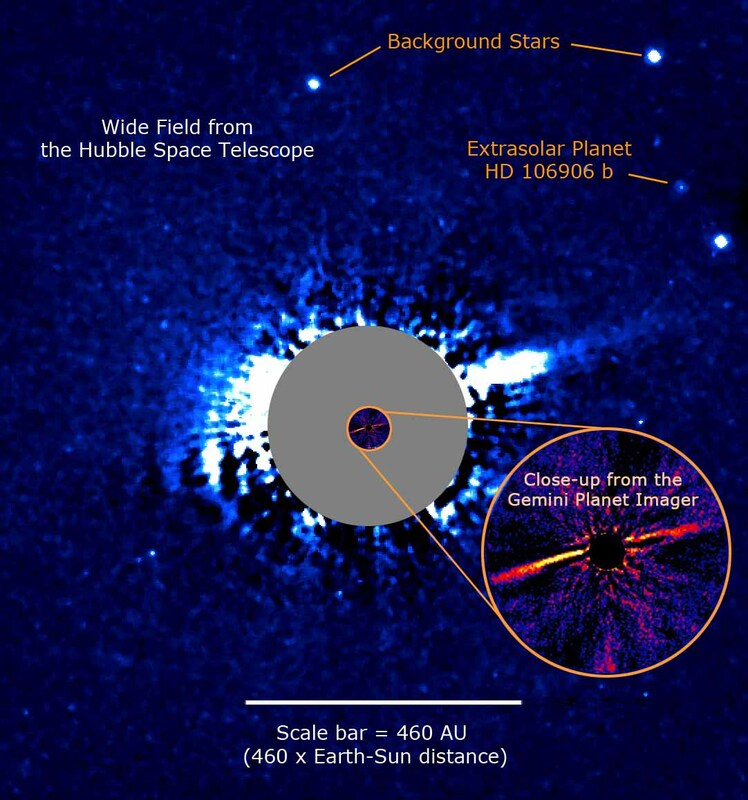 GPI operates on the Gemini South telescope and provides extremely high-resolution, high-contrast direct imaging, integral field spectroscopy and polarimetry of exoplanets. Among Kalas’s coauthors are UC Berkeley graduate student Jason Wang. The research was supported by the National Science Foundation and NASA’s Nexus for Exoplanet System Science (NExSS) research coordination network sponsored by NASA’s Science Mission Directorate.